You could lose more that your vehicle, boat, motorcycle, or RV if it is stolen or involved in a major accident. You could lose your investment. Because most insurance policies only cover the value of your vehicle - something that rapidly declines during the first few years of ownership - your loan or lease balance could be higher than the value of your vehicle. Now you can protect your vehicle, boat motorcycle, or RV investment with Guaranteed Asset Protection (GAP). GAP is a non-insurance product and is made available via a loan/lease deficiency waiver that covers teh "gap" between the vehicle's value and the amount you stil owe. 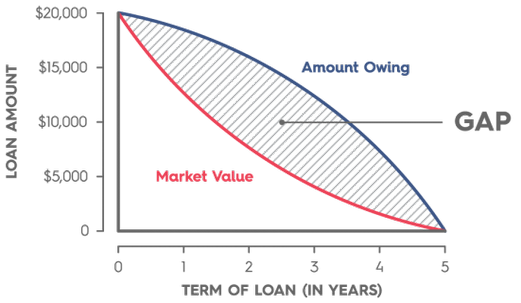 Essentially, GAP protects you and your entire investment from substantial loss. GAP was designed for all drivers, whether you finance or lease a new or used vehicle. Automobiles, vans, light trucks, motorcycles, boats, travel trailers, motor homes, golf carts, jet skis, snowmobiles, and almost any other vehicle* are eligible. GAP protection goes into effect when you need it most - when your vehicle is stolen and isn't recovered, or is totaled in an accident and can't be repaired. *Please consult your finacial representative to determine if all of these collateral types are eligible for GAP protection. You Stay In The Driver's Seat. **Deductible coverage is available in most, but not all states. Please consult your financing representative for the availavility of thie benefit. Please consult with one of our loan officers to find out more information regarding this service.